Where: On any road, particularly in urban areas. 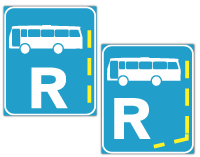 Purpose: Signs and indicate that no other class of vehicle may use that part of the road. Action: Do not follow this bus route if you are not driving a bus.